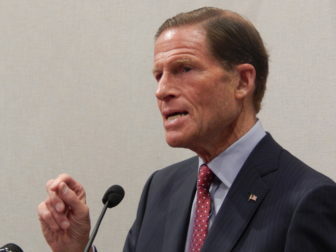 Washington – Sen. Richard Blumenthal on Wednesday joined five other Democratic senators in asking the FBI to provide them with the name and status of all individuals who currently hold interim security clearances at the White House, and asking the agency whether any of them have access to classified information. “We are deeply concerned that high-level officials operating under an interim security clearance, like Jared Kushner, read the president’s daily intelligence briefing,” the senators wrote. About 30 to 40 White House employees have temporary security clearances. The issue of White House security clearances resurfaced last week after White House staff secretary Rob Porter resigned amid allegations of verbally and physically abusing his two ex-wives. Porter had a temporary clearance and was permitted access to classified information. Speechwriter David Sorensen, who worked at the Council on Environmental Quality and also had a temporary clearance, stepped down on Friday over domestic abuse allegations. Both Porter and Sorensen deny the allegations. On Wednesday, George David Banks, a senior official on the National Economic Council, said he resigned after being informed he would not receive a permanent security clearance because of his past marijuana use. Wray testified at a Senate Intelligence Committee hearing Tuesday that the FBI had completed a partial report on Porter in March, finished its full report in late July, responded to a White House request for follow-up information in November, and closed the file in January. That seems to contradict a White House timeline on Porter’s investigation by the FBI. While the FBI investigates applicants for security clearances, the president has the power to grant security clearance to anyone at his discretion. Last week, Blumenthal joined other Democratic senators in writing to White House Chief of Staff John Kelly and White House Counsel Don McGahn to raise concerns about Porter’s ongoing access to classified information even after Kelly was notified that Porter was unable to obtain a security clearance. Blumenthal also has joined other Democrats in requesting an inspector general’s investigation into the Trump administration’s process for determining access to classified information.